The Thrifty Gypsy's Travels : Destination Guessing Game! The destination is not one, but actually two! 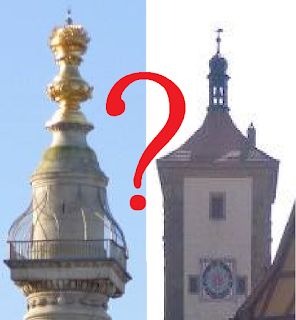 Do you know these two spires & where they reside? If you do, our destinations you’ll correctly surmise!" Good thing I didn't try to get a job writing poetry! So if you keep up with my Instagram, Twitter, or Facebook, you'll know that we're leaving on a jet plane... next week! It's the second-most last-minute trip we've ever had, and I'm dubbing it the "Babymoon" as it's now all but guaranteed to be our last international trip before Baby Gypsy arrives. Anyway, I thought it would be fun to have people guess the destinations to win a postcard of the correct guess! Think you recognize the two pictures above? Leave a comment here, on Twitter, Instagram, or Facebook! I'll reveal the answer tonight! What was the most last-minute international trip you've been on? I'll just keep tossing out guesses! Poland?